The Hut People are rapidly gaining more and more of reputation as one of the hottest & most entertaining world/folk acts touring today. Taking the audience on a voyage across the globe with their material, they perform a high-octane unique blend of home-grown tunes mixed with British, Nordic and European folk music, perfectly formed & embellished with the driving accordion and a mind-boggling array of exotic percussion. 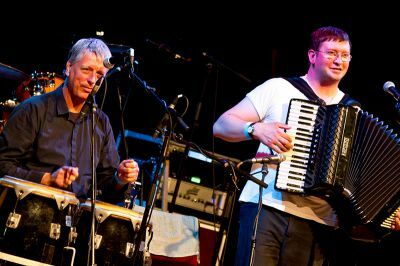 Accordionist Sam Pirt also performs with 422 (previous Radio 2 Folk awards winners) and is a very experienced musician who is well established within the folk circuit. Sam has in the past performed alongside Kathryn Tickell, The Dubliners, Sharon Shannon, Jez Lowe, Brian Finnegan, Brian McNeill and many others. He is also the founder of Ethno England. Percussionist Gary Hammond has for the past 12 years recorded and toured with The Beautiful South. He has also worked with Nina Simone and has frequently been a part of many other groups and collaborations within the World, Jazz & Pop genres. Great music aside, a show from The Hut People is filled to the brim with spontaneity, often hilarious patter and a 110% commitment to their getting-the-crowd-involved ethos. Don’t miss them.